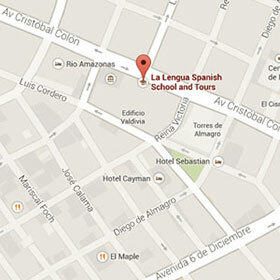 The La Lengua Spanish School also offers Spanish classes online via Skype with native Ecuadorian teachers. Our programs are personalized and focused according to the needs and the language level of each student. Our classes are one-to-one and it’s just if you were sitting face to face with your teacher. Classes for all language levels: from beginner to advanced. Take lessons from your home, your work or while you are travelling as your classroom is wherever you have internet connection. Develop your skills: use of vocabulary, fluency in communication, grammar and pronunciation. Sit back and enjoy a new way to learn Spanish. La Lengua not only teaches you to speak Spanish, it also helps you to understand Ecuadorians culture and customs. For those who are interested in discovering Ecuador and its people, La Lengua also offers volunteering opportunities and guided tours! Av. Cristóbal Colón E6-12 and Rábida - Building "Ave Maria"
With one click you can find us on Google Maps.